In Carlisle, exit at High Street (exit 49/old exit 16). Bear right at the stop sign and continue driving towards downtown Carlisle. Go through the square at Hanover Street and continue on High Street, crossing Pitt Street and West Street. 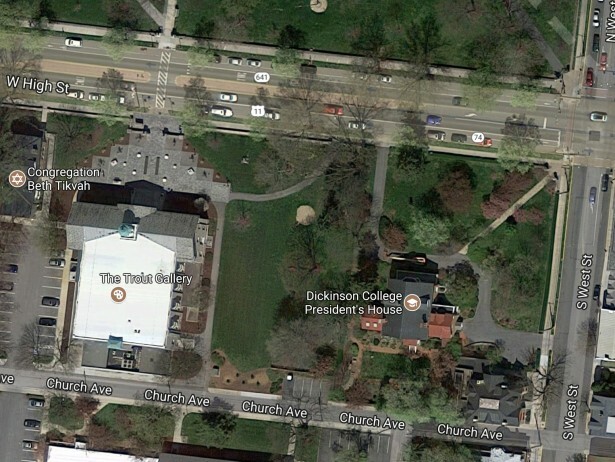 The Weiss Center/Trout Gallery is the building on the left at the pedestrian crosswalk. Continue on I-83 to the Pennsylvania Turnpike. 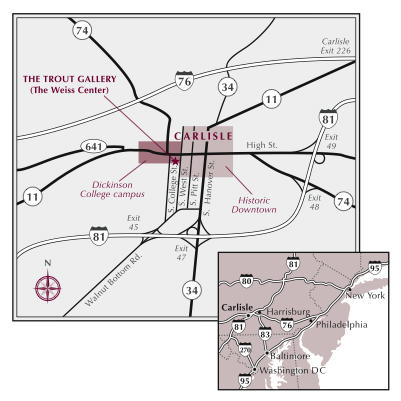 Take the Pennsylvania Turnpike (I-76) west to Carlisle (exit 226/old exit 16). Bear to the right onto Rt. 11 South. Take Rt. 11 (Hanover Street) into downtown Carlisle (approximately 3 miles). Turn right at the square onto High Street. Continue on High Street, crossing Pitt Street and West Street. Continue north on Rt. 15 towards Gettysburg. Exit onto Rt. 15 and follow north to Rt. 94 (York Springs). Exit onto RT. 94 and follow north to Mt. Holly Springs. Rt. 94 will merge into Rt. 34 north. Continue on Rt. 34 into Carlisle, where it becomes Hanover Street. Go to the downtown area; at the main square, turn left onto High Street. Take I-81 north into Pennsylvania. In Carlisle, exit at Hanover Street (exit 47/old exit 14). Turn left at the stop sign and continue driving towards downtown Carlisle. At the main square, turn left onto High Street. From the Lincoln Tunnel, take Rt. 495 to the New Jersey Turnpike and follow the turnpike south to I-78. Travel west on I-78 into Pennsylvania and then take I-81 south. Take the Pennsylvania Turnpike (I-76) east to Carlisle (exit 226/old exit 16).